Greyhounds in the Mist: 5 months ago I lost a rather large chunk of my heart, My Andretti was cut loose his mortal coil, far far too soon. 5 months ago I lost a rather large chunk of my heart, My Andretti was cut loose his mortal coil, far far too soon. He will never leave me; he is my heart, he is my soulpartner and I am his. 5 months ago my heart, my love, Andretti passed away suddenly and unexpectedly. My tears have not stopped falling, I think of him almost everyday. I miss his soft browness and his unflagging dedication to making me think I wasn't the #1 in his life. But I was, and he was my #1, and we both knew it. I pine for the connection he and I had at a very base level; he was mine and I was his, there was never one moment in our lives that I questioned that. 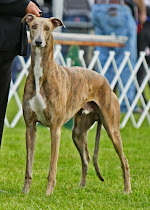 For 8 1/2 short years Andretti was my constant companion and a great ambassador of the breed. He was a confident, happy and outgoing soul who wore many hats and excelled in so many ways. He could course, but loved the lure maybe just a bit to selfishly. He was a fiend for agility, but was far to accident prone to ever participate without giving observers heart palpitations. He was an obedience champion, but told me when he was finished showing off to judges for titles to prove it. He only thrived in the conformation ring once he became a veteran and people would clap for him due to his age, otherwise he found it mind-numbing. He taught more veterinary students more things than anyone cares to remember, and saved so many lives by donating fresh blood every time he was called upon. He loved children madly, even though we have none. He tolerated cats, a lot. He worked the ranch like a professional, supervising all tasks horse, sheep or chicken related. He managed the pack flawlessly, policing all fun and reporting any and all insubordination. He was a peacekeeper, setting the example for all newcomers, permanent or transient, human, canine, feline, equine. No matter, Andretti set the flavor and tone and nobody ever challenged it. Andretti was the perfect dog for me. When I was asked what I was looking for in a puppy, I said personality. I wanted a confident and clever dog, I got that and more. I'll never know how Kim knew that he and I were meant for each other but I am forever grateful for her matchmaking skills. Andretti died in my arms, it was just him and me and the silence that comes with death's passage. The moment his heart stopped beating, a piece of my heart died forever. He was my first greyhound, and he will forever be my best greyhound. Godspeed, Andretti, I'll see you on the flip side. I promise. I'm really sorry for your loss! It brought to mind the loss of my first Greyhound five years ago. She was like an extension of my arm, and I was a bit of an extension of her, too. When she died, I felt like an amputee for a long time. We just lost our Blueberry a few weeks ago, too, and well, it's just hard. There is absolutely no good way for them to go, and never ever enough time. Wonderful tribute for your best friend. So very sorry for your loss. I hope to have my first Greyhound (Beryl) for many years yet but forever wouldn't be long enough. 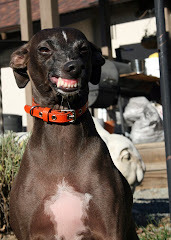 Well, I just finished reading your wonderful blog on Raw feeding. Then flipped to your most recent blog to learn of your sad news. I am sitting here all sappy and heart broken for you with tears in my eyes. Funny thing is Lilly our (ex-racing greyhound) came over to my lap, nudged my face as if to say, its all right Mom, don't be silly. What comforting words can I say other than I am sorry for your great loss. 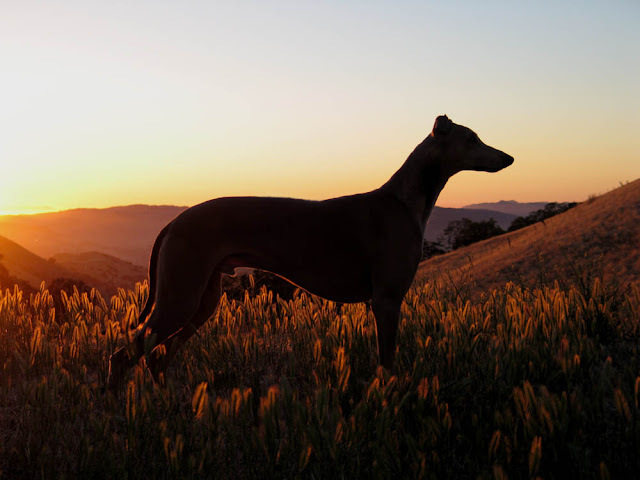 Our canine companions time with us is simply just too short. God bless and comfort you and your family. Yeah, I checked them out after your last post and I'm totally obsessed. I'm so sorry for your loss, your #1. Such a heart break, we g-hound owners can relate to. 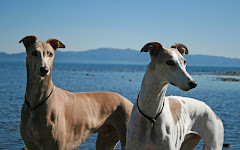 If you are still involved with greyhounds please return to blogging!